24 posts categorized "State of the church"
One of the questions people always ask about the ethnic killings in Burundi and Rwanda is how it was that Christians were able to do such terrible things. As you meet people and talk about the conditions that led to ordinary people hacking their neighbors to death with machetes, you learn that a major factor was the role played by political leaders who used underlying group attitudes to their political advantage. For months they stressed the danger in "those people" who were "not like us." They were morally inferior. They were not to be trusted. They were liars and cheats and were secretly planning harm once they had power. Something had to be done to stop them once and for all. This was repeated incessantly over the radio, on television and in written form. It was spread by word of mouth. Until it became reality. These ideas were not new, of course. The history of Hutus and Tutsis in Rwanda and Burundi had been one of competition, rivalry and conflict ... of past injustices, jealousy and insecurity. And so opportunistic leaders found a ready bed on which to lie their seductive plan for power. All they had to do was stoke the fears and then provide themselves as the key to allaying them. In Rwanda and Burundi, this led to civil disaster -- an attempted genocide in Rwanda and 11 years of civil war and unrest in Burundi. Both countries, and neighboring Congo as well, are still struggling to move forward out of the ruins left from the patterns of hatred, violence and revenge that were set in place more than a decade ago. And Westerners are left saying, "How could that happen?" as if it could never happen in their country. That's why I've had to shake my head when I heard candidates saying Barack Obama and East Coast liberals "don't see America like we do." Then talk about those other people who apparently don't love America because they don't always see it as perfect or because they might criticize it. And then to see them take it to he next level, saying that Barack Obama somehow is linked to terrorists, tapping into those core fears that exist in our society. Old fears about revenge that black people are certainly hoping to exact on white society for years of slavery and racism. Fears about Arabs and Muslims and what they are secretly planning to do in this country. I shake my head because I see political leaders doing here exactly what they were doing in Rwanda and Burundi. The message is the same. It's not a question of different ideas. The argument goes much deeper: These people are not to be trusted. They are to be feared. They will bring us harm. To his credit, John McCain reacted well when he was faced with the fruit of his own campaign's actions, taking the microphone from a woman who echoed the words she had heard "I don't trust Obama" and then saying, "He's an Arab." McCain, visibly embarrassed by the crowd's attitude, responds, "No, he's a decent family man." Civil Rights hero John Lewis has been criticized for comparing the McCain campaign's words to those of then-racist Alabama Gov. Wallace in the 1960s. Well I'm calling his Wallace and upping him one Rwandan genocide. Lewis was dead-on when he said that McCain and Palin were sowing the seeds of hatred and division. The point is not that they are racist or wanting to spread hatred like Wallace did. But Lewis knows that the root of hatred and mob behavior begins in painting people as dangerous and evil. He knows what he's talking about because he lived it. Unfortunately, McCain, like most mainstream Western people, thinks that "we" are not capable of the same evil acts as "those other people." We are decent people, right? Unlike Rwandans and Burundis? Unlike those Arabs? But my concern is not really what politicians are doing. Many people on the left and the right are already crying out about this. My concern is that I am pretty confident that Christians make up a significant percentage of the people in the crowds booing and angrily shouting about Obama. I can't prove it. But I do know many Christians who would be ready to scream with these crowds. I read their Sarah Palin fan club site discussions on Facebook. I see what people are saying on blogs. I know that Christians are part of this environment of fear and hate. I keep thinking of what Jesus said would be the trait by which the world would know who were the followers of Christ. "By your love." About Jesus words about loving your neighbor as yourself. About loving even your enemy. About how you treat even those who seek to do you harm. These are the words of Jesus, those radical words, that are at the heart of our work on reconciliation in Burundi. We have met so many people there who are radically ready to love. And in doing so, they are setting an example for their country and their culture. It's time American Christians decide to follow the example and teaching of their Lord instead of their political leaders. Time they set the tone of love rather than following a tone of fear and hatred. Politicians are doing what politicians do. They seek to win elections. It's in their DNA. Christians, on the other hand, claim to have another DNA working in them. They say that they are not governed by fear. That they are confident because they believe in a God who loves them and who has good plans and desires for his creation. So they should be able to overcome their very human fears and selfish tendencies. People like John Lewis and myself may sound like we're blowing things out of proportion. Perhaps the U.S. is not on the verge of a genocide, but the country could be on the verge of losing much of the ground gained on racial reconciliation over the years. We could be on the verge of seeing races move further away from a place of true understanding and real healing. Years of progress are in jeopardy. I don't believe that McCain is a racist or that he has allowed this atmosphere on purpose. I give him the benefit of the doubt. But we need to understand in the West, just as in Burundi, that buttons being pushed now could have serious consequences later. Sound alarmist? Take a trip to Burundi or Rwanda, Kosovo or Kenya. Ask the people in those places whether they had thought it could happen in their country and how it came to pass. Ask the Christians in those places what they might have done differently had they heard this message BEFORE it was too late. A prayer for American Tom Fox, Briton Norman Kember, and Canadians James Loney and Harmeet Sooden -- all working for the Christian Peacemaker Teams organization. 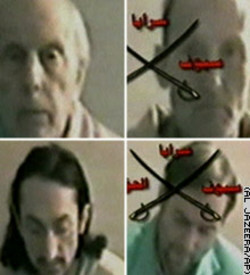 They were kidnapped on November 26 in Iraq. Lord, please strengthen these four brothers and sustain them by your presence in their hearts. I pray that you would be even more real to them now in this time of fear and need, and that they would continue to be a witness to us all, speaking of the power of non-violent love in the face of violence and hatred. Please help their families in this difficult time. Comfort them and visit them, please. Speak to their captors. Help them to see you in these four men. Help them to see your love. Your courage. Your compassion. Your strength. Your vulnerability, even? Does that make sense? At any rate, we know that you are capable of setting them free and delivering them, but even if you do not, may your name be glorified, and may you Way be promoted. Found some interesting stuff here on ways to look at church. I was talking to a collegue here about what we want to see developing in the things we do with disciples and Erwin McManus came up. After a google search, I came across this site, with notes from a recent conference McManus was taking part in. In 1965, at a turning point in the battle for voting rights for all people in America, the line was drawn in the sand. Alabama officials were determined not to capitulate to King and others in the growing protest movement against the exclusion of African Americans from the polls. The mostly African-American protesters who had gathered in Selma to March and demand that blacks be allowed to register to vote had been beaten, turned back and overwhelmed by government forces and regular vigilante white citizens. Martin Luther King Jr. made a desperate call to ministers across the country to come to Selma in support of their black brothers and sisters. He knew that this battle had to be won, and that help was needed. 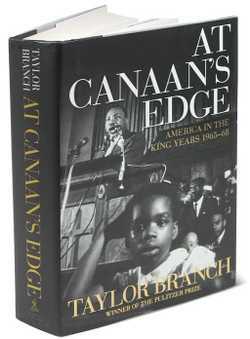 In At Canaan's Edge (click here to hear an interview), Taylor Branch describes a response that was both encouraging and discouraging. There were many white Christians who responded. Catholics, Jews, and others. They came in fairly large numbers. They marched. Some were beaten. One even was killed. Not all was noble about the response, but they came. But it was discouraging that absent from the list of those who came would be those white Christians who would have been from traditions that evolved into today's Evangelical Christians. There were Catholics, Episcopalians, Lutherans, Presbyterians, Jews, even Unitarian Universalists. But Baptists? Others? Many were on the other side. But still many others simply were focused on personal righteouness while believing that they shouldn't be involved in stirring up trouble. Just save souls. And let God do the rest. One part of the church wanted the King without the kingdom, the other the kingdom without the King. The outrage in much of the Muslim world about the political cartoons finally got me to act on an impulse to write some thoughts down that has been brewing in my since Martin Luther King Day. I was reflecting on the message of MLK and how sad it is that though we now honor his legacy with a national holiday, our nation -- and especially much of the church that I am linked to -- seems to have missed the importance of what King was about (and what the King was about). When Coretta Scott King died a few days ago, I watched the news reports and was saddened again that the reports evoked images of the Civil Rights movement without an understanding of what was at the heart of it all. There were people who believed that justice was important and that the way the world was at that time was not the way God intended it to be. Many of them understood that following the King meant being willing to sacrifice and to suffer -- even unto death for some of them -- in order to see Thy kingdom come, Thy will be done on earth as it is in heaven. Loving our enemies? Loving those who mistreat us? I was thinking about the lack of these voices in the Christian environment and country that I know best. Then I got my hands on the latest installment in Taylor Branch's work on the civil rights movement of the 1960s, At Canaan's Edge. I have mentioned before my admiration for Taylor Branch's work in Parting the Waters. I still think it ought to be required reading for every American. My friend Mark Soderquist, in town for Brian McClaren's visit with us a couple of weeks ago, brought me At Canaan's Edge. And this one hit me in an even deeper way because the events described take place in the year I was born. In 1965, people were still being beaten and killed just for wanting to vote. There were still counties where no black person had EVER been allowed to register to vote. Women, too, were still excluded from an alarming array of places (like the Washington press club), jobs and opportunities that we take for granted now. In our nation's capital hotels were still largely segregated. I could not have gone to the same hotel as my wife. United States immigration policy, without shame, closed its doors selectively to non-Europeans. This was the world I was born into. As I lay in my crib, oblivious, people were risking their lives to see this world change because they believed things were not the way they were supposed to be. If I sit here in France, with an interacial family, supported financially by a mix of white and black churches and individuals, serving in a muli-ethnic international church in Paris -- I realize that I owe a debt to those who understood these principles. Not only was the United States changed, Branch points out, but the entire world stood up and took notice to this movement. Its effects have influenced change in places like South Africa, Berlin and Tienananmen square in China. No, His will is not done here on earth. But someone realized that following Him meant doing things His way and following His example. ... "Master, what takes more courage? To cut off the ear of the guard taking you into custody, or to love the guard, heal him, accept his abuse and die in order to set even him free of his hatred?" What takes more courage? To strike back after terrorism with hatred, anger, vengefulness and force in order to protect ourselves against further attacks, or to love those who would do harm -- even accepting that some more of us might die in terror attacks -- in order to show that we truly do follow another way? MLK and many others applied the principles of the King in order to fight for Kingdom principles here on earth, and they changed the world in which I would live. We need voices like this today. Our Muslim friends need to hear and see such courage. Our Jewish friends in Israel as well. Tchechens and Russians. Hutus and Tutsis. Sudanese people in Dafour ... The list goes on. They need to see that His way works. So do husbands and wives, brothers and sisters, neighbors and friends who have hurt one another and who are bound by this pain and hurt. Just as I was oblivious in 1965 in my crib, it saddens me to see that much of the church is again oblivious to the call for the kingdom in this world. Justice. Shalom. So much could change if we were willing to follow the Way of Christ, instead of the ways of our world. McClaren said it well when he was here : "It's been said that a certain part of the church seems to want the kingdom without the King while the other wants the King without the kingdom." The world we are in today desperately needs both. And I don't believe many people will be interested in the King if they see no evidence of his promised very different kingdom being lived out by His disciples. Still reflecting on the lessons we get from the banlieu. Just as France is struggling to figure out how to better deal with the different cultures that now make up this country, we in the church are struggling to learn to value and learn from different parts of our Body. But if you need some incentive to take the need for cultural diversity seriously, here are a few things for you. 1. One of the reasons that Western missions here cannot respond effectively in the banlieu is that almost ALL Western missionaries here are white. Not that that disqualifies you from being effective! Really. That's not what I'm saying. But my experience as a Black American gives me a certain understanding and compassion for what is going on in the banlieu that most (I stress most) white Americans don't have. Not only that, but it is much easier for a non-white person to gain the trust and to speak into the lives of people in these situations. If the church in America weren't so segregated, there would be more African-American missionaries on the field. And even the white missionaries and French Christians here would be gaining from the perspective of the their non-white brothers and sisters. 2. North American mission groups tend to work through a model that is typically American -- segregation. They tend to be focused on people groups or religious groups. This group works with Muslims. This group with North Africans. This group with non-Arab North Africans. This one with black African Muslims. ... This is quite effective, of course, because it enables workers to develop specific knowlege about their target group. But it goes against the grain of certain needs here. The need for integration and cultural understanding. How do we challenge the French church to understand and better serve their African neighbors? If we keep people in their little subcultures, how do we model for French society how Africans and French, Muslims and Christians, etc., can live together and learn from one another? It is also very difficult in Paris, where we live, to focus on one group. When we were with the North African fellowship we found that French were always coming because they liked the style of meeting we had. And North Africans kept inviting their friends -- of all races -- to come with them. I finally realized that it was silly to be discouraging them for the sake of protecting the "North Africaness" of our meetings. That was one of the main reasons we stopped working in that context exclusively and started focusing on being and making disciples for all people. 3. The experiences of people like Augustin (see yesterday's post) are invaluable. Who can speak about forgiveness and reconciliation better than someone who has seen family killed over ethnic differences? It's easy to tell an kid from the banlieu that he needs to forgive those who mistreat him. But does an American missionary from an all-white community and all white church have much credibility to do so? We need to have the voices of Augustin and others speaking into the church, but also speaking out to the world. OK. I'm stopping there. So much to be said. But trying to be brief. I was talking to Augustin today. He's a pastor with whom I work from the little African nation of Burundi. He's been in France since fleeing during the terrible ethnic violence that struck the country in 1993. If you saw Hotel Rwanda, then you know a little bit about the kind of thing Burundi went through. Augustin knows something about ethnic frustration and injustice. And also what happens when we don't deal with it properly. He saw family and friends killed. He has two adopted children -- the same age as my kids -- who are dealing with the trauma of having their parents killed before them, and then being shuffled around until finding a home in France. He also was the pastor of a church in one of the banlieu (suburbs) north of Paris for several years before quitting that role to work on other things. So I thought it would be interesting to hear what he had to say about what's going on there and about the church's response. Augustin, who serves as a prison and hospital chaplain among other things, told me that he understands why the young men are doing what they're doing. And that many of us in the church would do well to seek to understand them as well. He mentioned Jesus' example at the death of Lazarus. "Jesus went to be with them. He felt their pain and cried with them," Augustin said. "But he also knew he had something that could change the situation. So he demonstrated the hope that was in him. "He didn't just say that he was the Life. He demonstrated it." In other words, if we say that Christ is really life, then how is He life in the banlieu? How does he bring back things from the dead? He's seeking to organize some people from his community to action. Not an evangelism campaign. But actively listening to and engaging the immigrant community. I told him that this is not just for churches in the banlieu, though. There's a societal problem of the way the cities and suburbs are related. Christians from the city need to be a part of the response, too. "True, but I have to start somewhere," Augustin said. "Seems the best place to start is where I live." The violent protests in the suburbs of France's cities this month got me thinking about the years I spent working with a North African fellowship here in Paris. Our group, an indigenous North African group, and several others that were launched by (primarily) North American mission organizations using the same principles, were particularly effective in many ways. But seeing the cars burning and angry young immigrants reveling in their moment of identity confirmed for me again how important it is that we see beyond "preaching the gospel" and getting people "saved." I was wondering how many disciples are effectively speaking into the lives of some of those young people in the suburbs. Not preaching to them, but just living beside them as examples. How many of these young people know or have heard of another way to deal with the frustration of being between cultures -- not fully African, not fully French, not appreciated or totally accepted in either place. How many of them would EVER hear such things if they did come in contact with a church, or with Christians. How many of them would find Christians who understand their situation, or who at least know how to listen with compassion. I'm asking the questions because I was reading an article about a young guy who is working as a mediator in the difficult suburban projects. He's an African who grew up in the "hood." Now he's made it out, kind of. He has an apartment with his girlfriend in a nearby town. Now he's working with young people from the projects, trying to help them see hope and to see a way that they can create a future for themselves. He said he is a picture of hope for them. He embodies hope, because he's one of them who has made something of his life. "My message is that they can do it, too," he said. "I don't have to say it, my life is an example to them." Wow! Where have I heard that idea before? The young man is a Muslim from Senegal, by the way. The government here, struggling to figure out how to respond to the wake-up call that these uprisings have represented, is seeking people like this young African. Because they need people who understand the issues and can offer solutions. The government is listening to and watching what this young African has to show them. So, what about all the disciples we've made over the past 20 years. Hundreds, perhaps thousands, of North Africans have become Christians in France during this time span. And let's not limit ourselves to North Africans. This issue is not just about them. But about the church as a whole. I know there are some people out there working anonymously, doing some really neat things. But I also know that for the most part, evangelical Christians have been operating under a model that makes them irrelevant to this discussion. We have been focused on getting people saved. Preaching the gospel, not demonstrating it. ... So, when the cars started burning, the church was asking the same questions as everyone else. Why? What can we do? Where do we go from here? It seems to me that many of us should have already had those answers and been about the business of demonstrating effective answers. Is it possible that we can help people even if they don't become Christians? Is it possible that the Name of Christ is honored just as much if lives are turned around because of the hope that WE represent? Perhaps the magazine articles would be written about a community of Christians that were making a difference in a neighborhood. Not because they were preaching the Gospel, but that they were loving their neighbors. Perhaps the mayor of Clichy-sous-Bois or whatever town would be interested in hearing about reconciliation principles. Really, people are all ears these days. But they don't want to hear about getting saved. They just want some answers. Some workable examples. Some hope. Do we have any? Not just words. Do we have any flesh-and-blood examples, like our friend from Senegal? I've been wanting to write for weeks about being a disciple in the world -- in light of what is happening in Sudan and in many other places on our planet. I was finally pushed by some brothers in the States to get something in "ink." Joe K and Jim K, two ex-colleagues from my newspaper days, both sent me info from a report by Save the Children on the state of mothers and children in the world. Burkina Faso, Madagascar, Burundi and Congo -- all countries with which we are developing ties through disciples in Paris -- were all near the bottom of this index, with Burkina showing up with many miserable statistics. Among them, fewer than 1 in 10 women can read in write in Burkina Faso. This was His mission, and it is ours. We no longer see action (either in giving, political action or in organizing networks for relief, education and development) as separate from making disciples where we are. It is part of the same process. We are finding that people who are not following Jesus often are drawn to Him through the compassion and love they see displayed by His followers. Likewise, many are convinced of the futility of Christianity because they too often don't see this kind of compassion in us. In the same way, those who have started to walk with Christ see their faith deepened as they respond to the challenge of the world and believe that, through Christ, there is something they can do about it. I also came across this post on a blog from someone working in France. Challenging stuff. Lord, help us not to just talk and blog. I was blown away like so many others by the story of Ashley Smith, the woman taken hostage by a man wanted for murder. Her story and the interest it has created is another excellent example of someone who puts Jesus' teaching into action in a dramatic way and how much louder faith like this speaks than our many evangelistic words. I saw an interesting article in Christianity today about it. But first I came across the New York Times article in my e-mail this morning. As much as I was encouraged by this young woman's living faith, I had to shake my head at the quote from a noted Christian pastor at the end of the article. Here's the quote from the article. But (the noted Christian leader) cautioned against interpreting the incident as an "unfolding of God's plan," because no one really knew enough about the two people, what really happened between them and whether they truly committed themselves to God. "You can only see the fruit of it in the time to come," he said. Our single-minded focus on "genuine conversion" as believing the right set of things makes it impossible to fully appreciate it when someone simply acts out what Jesus taught. I think we SAW the fruit of this woman's faith when it was tested. She acted with love. She put her faith on the table and spoke from her heart to this hurting man. Why do we need to add the disclaimer "but these two might not really be saved." ? Why not just praise God for a wonderful example of His truth being put into action displayed before a world that is hungry to see peace like this become possible?